Singaporean Defence Minister, Dr Ng Eng Hen, has confirmed that the south-east Asian nation would be pursuing the F-35 to replace the Republic of Singapore Air Force’s (RSAF) ageing fleet of F-16s, providing further industrial opportunities for Australian industry. Spearheaded by the RSAF and Defence Science and Technology Agency (DSTA), the initial technical evaluation process has identified the Lockheed Martin built F-35 Joint Strike Fighter as the preferred option to replace the nation's fleet of F-16s by 2030. The nation's fleet of 60 F-16s is currently undergoing mid-life upgrades to 'V' or 'Viper' standard, Lockheed Martin the manufacturer of both the F-16 and the F-35 describes the F-16V as the "most technologically advanced fourth-generation fighter in the world", incorporating technology developed for and incorporated into fifth-generation aircraft, namely the F-35. The core of the F-16V configuration is an Active Electronically Scanned Array (AESA) radar, a modern commercial off-the-shelf (COTS)-based avionics subsystem, a large-format, high-resolution display; and a high-volume, high-speed data bus. Operational capabilities are enhanced through a Link-16 Theatre Data Link, Sniper Advanced Targeting Pod, advanced weapons, precision GPS navigation, and the Automatic Ground Collision Avoidance System (Auto GCAS). In particular, the highly-specialised and advanced APG-83 AESA radar provides F-16V with fifth-generation fighter radar capabilities by leveraging hardware and software commonality with F-22 and F-35 AESA radars. Recognising the 'soft introduction' to fifth-generation air combat capability, Singapore's Ministry of Defence (MINDEF) announced the nation's intent to purchase a small number of F-35 Joint Strike Fighters for a comprehensive technical, capability and suitability tests prior to deciding on a full fleet. "The technical evaluation also concluded that the RSAF should first purchase a small number of F-35 JSFs for a full evaluation of their capabilities and suitability before deciding on a full fleet. In the next phase, MINDEF will discuss details with relevant parties in the US before confirming its decision to acquire the F-35 JSFs for Singapore's defence capabilities," the Singapore Ministry of Defence release said. Minister Ng expanded on the comments made by MINDEF, saying, "They [defence agencies] have decided that the F-35 would be the most suitable replacement fighter. We want to procure a few planes first, to fully evaluate the capabilities of the F-35 before deciding on the acquisition of a full fleet." Singapore has maintained a long period of connection and integration with the F-35 program as a 'Security Cooperative Participant' along with Israel to ensure that the nation was well positioned to take advantage of the fifth-generation aircraft, should it prove suitable for the nation's air combat requirements. "Our RSAF F-16s that were in service since 1998 will have to retire soon after 2030, even after their mid-life upgrades. That’s not very far away, just over 10 years, to acquire their replacement and, just as important, to build the logistic support and train pilots individually and as a fleet to guard our skies," Minister Ng added. Singapore is reportedly considering all variants of the F-35 platform, with a specific focus on the specialised, short take-off, vertical landing (STOVL) 'B' variant given the geographic realities of Singapore and the conventional take-off and landing (CTOL) 'A' variant of the aircraft to meet the nation's unique operational requirements. A Singaporean purchase of the F-35 will serve as a boon for Australian industry, particularly Queensland-based TAE Aerospace and BAE Systems Australia operations at Williamtown. TAE's new Turbine Engine Maintenance Facility (TEMF) at Bundamba will enable deeper-level maintenance for the F-135 engine modules for all F-35 variants operating in the Indo-Pacific. The specially designed, secure facility will provide optimised work areas for improved production flow, which is climate controlled throughout, while implementing an open plan design to maximise the use of space and equipment. Last year, TAE Aerospace chief executive and managing director Andrew Sanderson told Defence Connect, "The biggest growth opportunity for TAE is moving from an initial depot capability, to then begin competing for the broader regional F135 maintenance projects. 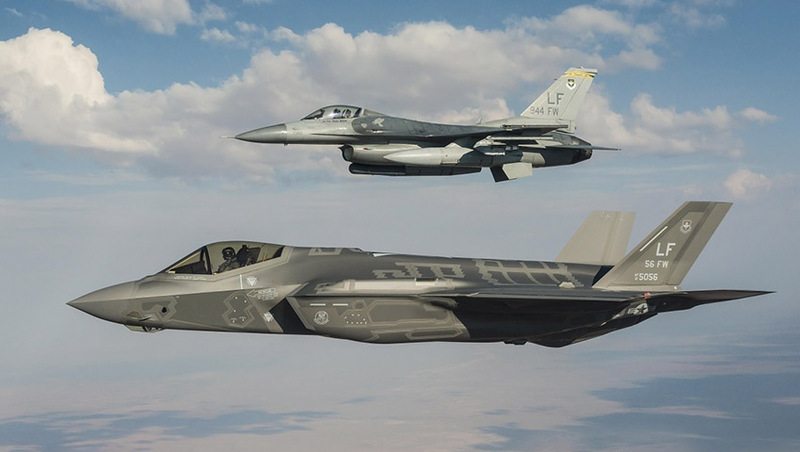 Building on that enables us to then compete for excess maintenance and sustainment work coming out of the US and even broader global F-35 partners." In early 2015, the US government assigned BAE Systems Australia (Williamtown) the regional F-35 airframe depot maintenance responsibility for the south Asia-Pacific region. In August 2017, BAE Systems Australia was also assigned the regional warehouse responsibility for the Asia-Pacific region. This Australian industry regional depot maintenance has responsibility for 64 of the first 65 aircraft components (Tier 1), assigned by the US government to BAE Systems, GE Aviation, Northrop Grumman and RUAG in November 2016. Regional assignments for the next tranche (Tier 2) of about 400 aircraft components are expected to occur in the latter part of 2018. The portfolio of F-35 sustainment activities at Williamtown will see about 400 jobs created over the next 10 years and a continuing requirement for this level of employment for the 30-plus years outlined as part of the contract. At the time, BAE Systems Australia chief executive Gabby Costigan said, "This is the first step in creating a depot capability in Australia. Our mechanical, avionics and structural technicians will be trained at the facility where the F-35 is designed and built. This training will ensure they have all the necessary skills to provide the very best support for the Royal Australian Air Force." Ten nations are currently flying F-35s, including the US, UK, Italy, Norway, Israel and Japan. The first of Australia’s F-35A aircraft are now based on home soil after a period of training and development at Luke Air Force Base in Arizona, US, plus a Pacific Ocean crossing in December 2018.